A pint of Guinness and a shot of Jameson shouldn’t just be reserved for St. Patrick's Day. 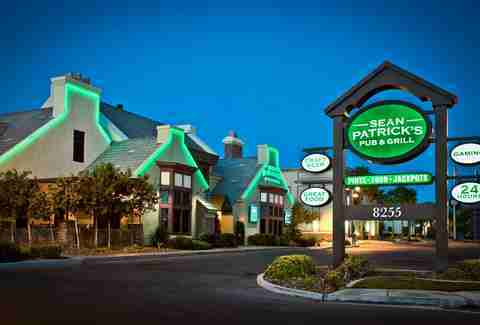 There are more than a few pubs here in Las Vegas that know how to celebrate the spirit of Ireland all year round. So take a look at some of ‘em below and gear up for a good time, some good music, and even better drinks. Hey, maybe you’ll end up grabbing a nice view. The perfect combination of size, charm, and a menu of authentic Irish food any time of day -- including a breakfast menu served 11pm-11am that features a tasty corned beef hash and poached eggs -- McMullan's is located just across the street from The Orleans casino. Take a seat at the bar and choose wisely from the deep selection of Irish whiskeys. The place really nails the Irish pub concept with an energetic atmosphere, private booths that feel like small apartments, and TV screens with nonstop rugby and football games. (And by "football," we of course mean soccer). 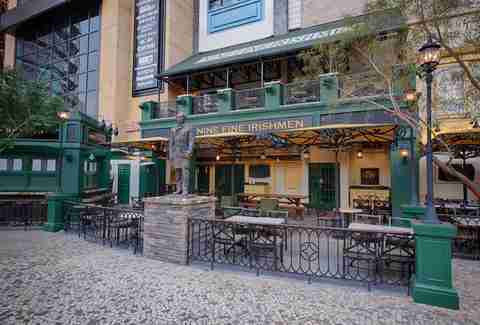 Built in Ireland first before being shipped to Las Vegas brick by brick, Nine Fine Irishmen is your best bet for an authentic Irish experience on the Strip. There's no shortage of stouts, ales, and lagers to enjoy on the outdoor patio, especially during the annual Celtic Feis celebration. It's one of the biggest St. Patrick's Day parties in town and takes place near a replica of the Brooklyn Bridge along Las Vegas Boulevard. 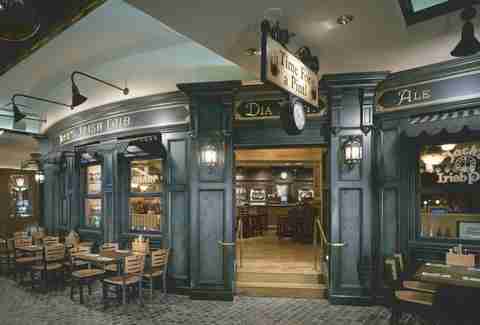 Rí Rá takes its whiskey selection seriously, and is probably the most fun you can have at a bar inside a shopping mall. Live music is offered seven nights a week, with bands often brought in directly from Ireland. Each room is distinct and modeled after vintage watering holes from Ireland, with salvaged items like a Georgian archway or an etched cut glass window that date back decades, if not longer. This is one of the few places inside the Boca Park shopping plaza that's open 24 hours a day, and just two doors down from The Vitamin Shoppe (in case you need to load up on extra Vitamin C after a long night of drinking). The atmosphere is fun, but the menu sticks pretty close to the usual bar food -- although names like the Dublin Cheesesteak Sandwich and the Blarney Burger at least make them seem Irish. 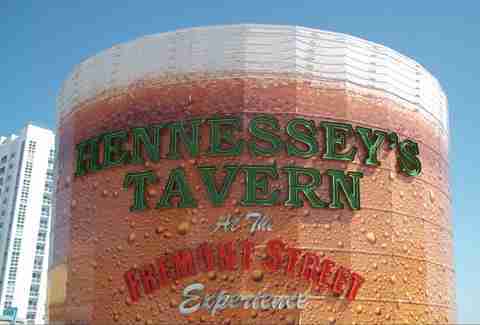 This place is easy to spot: just look for the world's tallest pint of beer out front. Sitting on the corner of Las Vegas Boulevard and the Fremont Street Experience, the multi-level bar attracts a large amount of locals in addition to the obvious tourists for a diverse lineup of bands and the tastiest Irish bar food Downtown. Go with the pound of ribs in Jameson BBQ sauce or the "Top O' The Mornin', Lunch or Evenin' Brekky Sandwich": two fried eggs on a pretzel roll with cheddar cheese and bacon. In addition to its own officially designated leprechaun, this Irish party hangout has beer pong, gambling, and music, along with two long bars down each side of a large rectangle of a room. It also serves as a gateway from The LINQ casino lobby to the outdoor promenade, offering the perfect excuse to grab a drink while on your way to play tourist on the High Roller observation wheel. 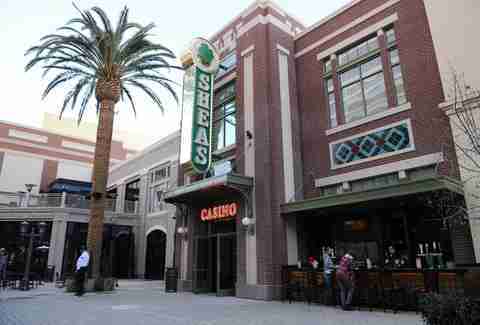 Plus, it's ground zero for The LINQ's annual St. Patrick's Day block party. 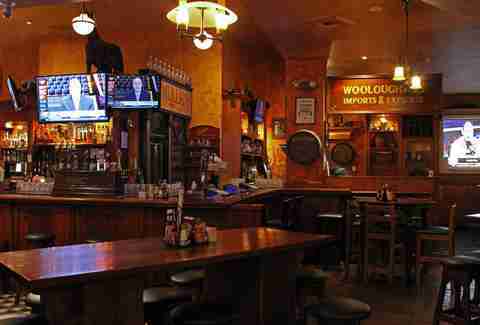 Also known as J.C. Wooloughan's, this little spot inside an off-Strip property may be one of the most overlooked Irish pubs on your list. But it's earned some loyal fans by proving to be a good value, with $3 craft brew specials, a beer garden on the patio, and generous portions of corned beef & cabbage. If you need more of a discount, there's a free shot of Guinness at 4pm each day, which just so happens to be midnight in Ireland. A few years ago, Morrissey's and Kavanaugh's was scooped up by the company behind PT's and Sierra Gold. What you have left over is pretty much an Irish pub version of PT's or Sierra Gold -- which means neighborhood locals taking advantage of a busy kitchen, gaming, billiards, and a hearty happy hour with half off any drink. There are two locations in North Las Vegas: one in the Southern Highlands and another in the West Valley near Summerlin. This is a more laid-back alternative to rowdier Irish pubs, but that's what you get when you're out by the water at Lake Las Vegas. 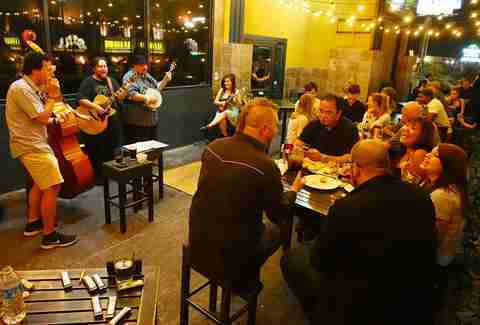 There's still plenty of fun, with lively nights of drinking and music. 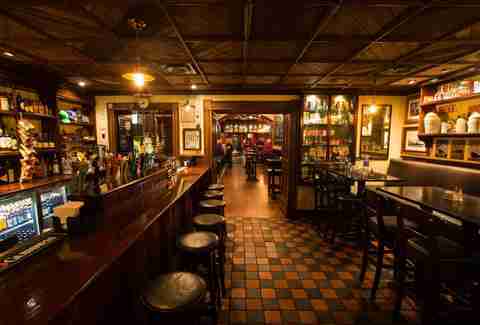 The cozy venue can get packed quickly, but it's definitely worth a visit for a pint of Guinness, Irish egg rolls, or a game of darts while strolling through the outdoor area known as The Village. McFadden's is an Irish bar and restaurant for the party crowd that pairs well with the Blue Martini hookup joint next door. If you like bartenders in skimpy plaid skirts pouring shots straight from the bottle, this is the joint for you. Everything from burgers and pizza to blue cheese Brussels sprouts are on the menu, but every meal should begin with an order of crispy bacon served in a pint glass. For some people, Palace Station is best known as the place O.J. Simpson got busted for robbery. But it's also home to underrated dining spots like Little Tony's Pizza and Oyster Bar. 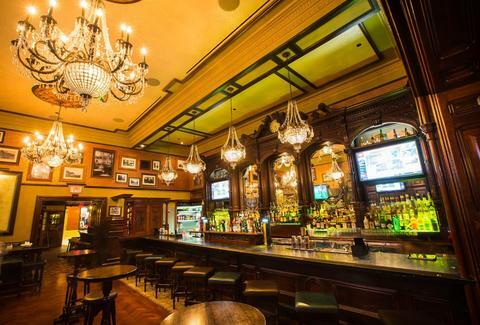 A worthy addition to the list is Jack's Irish Pub, which offers a cozy escape from the casino and a jumbo-sized happy hour 4-8pm every day, featuring two-for-one Jameson shots. 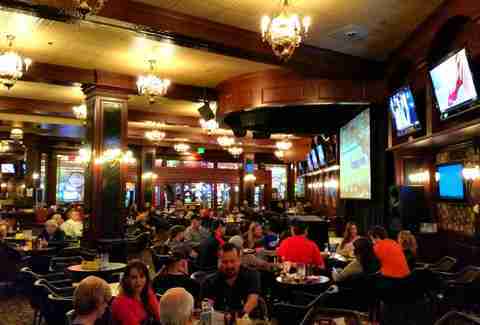 More of a casino sports bar than a traditional Irish pub, Brendan's is big, bright, and covered with TV screens. There's plenty of space and the energy tends to pick up when live musicians hit the stage (or when a big game is on). Just a warning: if you're looking for authentic Irish food, you're better off visiting McMullan's across the street. But don't worry, there's still a menu on each table at Brendan's offering Fuddruckers burgers from The Orleans' food court to keep your belly full between pints of beer. So, um, yeah. Rob Kachelriess knows an Irish Car Bomb is an "American thing" but is ordering one anyway for St. Patrick's Day. Follow him on Twitter @rkachelriess.